Having sorted out a number of problems I was having with the pattern for the Five Coat, I can now begin what will be the last calico test before making it for real. I quickly breeze my way though assembling the back of the coat (see right), having done it several times now and nailed the pattern a couple of goes back. 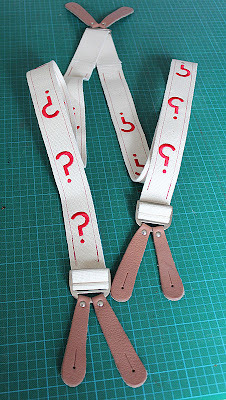 The fronts I am using are now to the revised design having cribbed it from the charity shop jacket last week. I have salvaged the piped pocket flaps I did for the last version, and set them in place (see left). The pocket bag is made in two flat halves, one of which is sewn behind the flap. The front half of the pocket bag is then sewn to the top of the skirt, and the two parts are then sewn together when the skirt is joined to the body of the coat, taking a detour around the pocket bag to create the opening. One thing I am introducing in this version of the test, since I am nearing completion on this phase, are some more involved tailoring techniques. When I extracted the front of the charity jacket, I found it had a lot of sewn in facings and padding across the upper chest (see right), and I think it is time I learnt to do this for this coat. I created patterns for the different layers and rebuilt it from fusible interfacing, scrim (which is a stiff form of hessian, though a bit finer) and fusible felt (see below). There are a few tricks I picked up which I won’t go into right now. I hope to outline these when I am doing the final coat for real. I put all this padding and support into my fronts and found it seemed to be doing the trick, giving it the professional feeling finish I have been looking for. 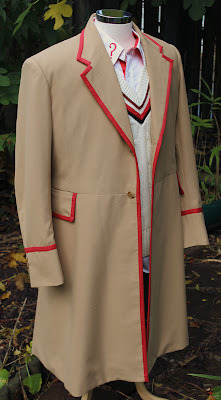 My next task will be to take a look at the inside pockets of the coat and see if I can replicate the tight, neat welts made in lining fabric – something I am not looking forward to! See how I get on in the next entry. You’ll be surprised!